The trip was unplanned. From Pangkalan Bun, we originally were scheduled to fly straight to Jakarta. 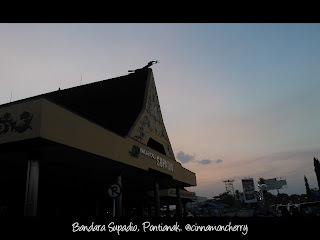 However, due to some technical difficulties, it is decided that we should go to Pontianak instead, then off to Jakarta. My partner and I have never been to Pontianak before, so we were very excited! We arrived in Pontianak when the sun was setting. The hues of the sky was splendid, I could stare at them for hours. Supadio Airport has some hornbill motifs as decorations, as you can see on the top of the roof. Hornbills are revered in Kalimantan. They occur in many paintings and statues. I was lucky enough to spot one in Tanjung Puting area. I love hornbills, though they tend to be a bit noisy, because they remind me of the place I was born in Sumatra. There, I could see hornbills, too. One even had a nest near our house. But I digress. 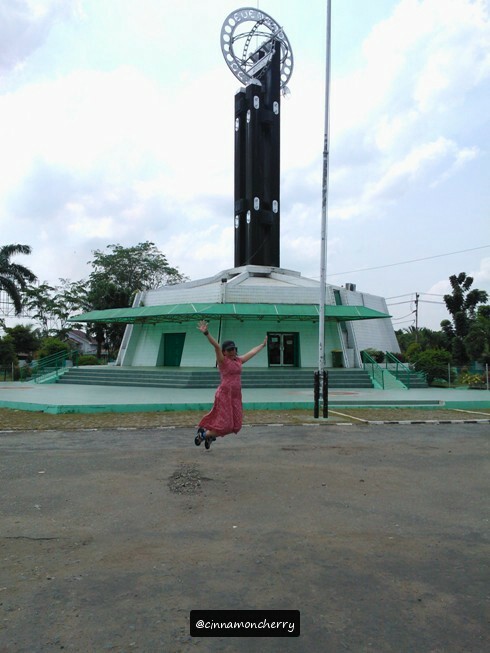 True, Pontianak is very hot! Around 10-11 AM, I bought two scoops of ice cream from a nearby mall, and on the way to the hotel (less than 5 minutes walk) 1/3 of the ice cream had already melted. Whew. But on the bright side, Pontianak has yum yum drinks to battle the heat, such as my favorite here, aloe vera. 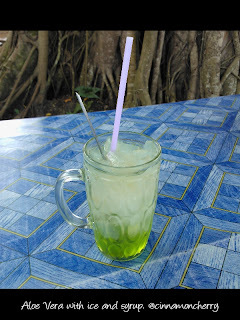 Aloe vera drink? Isn't it yucky, you might ask. I guess some Indonesians (yours truly included) have taken for granted that aloe vera's flesh is edible and very tasty, too. My late grandma used to skin the aloe vera and clean it, then boil it with certain ingredients until it was ready to be consumed. Here, diced aloe vera are mixed with syrup, water and ice to quench your thirst. I had it while sitting under a banyan tree. Very refreshing! 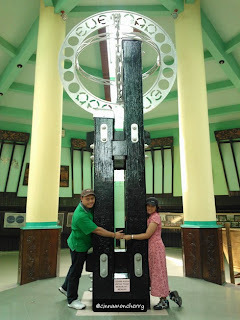 Of course, a visit to Tugu Khatulistiwa (Equator Monument) is a must when you're in town. This is how it looks from the outside. Just ignore the lady in pink dresses dancing in joy for no apparent reason. You can buy the miniature of the monument around here. From the small one encased in a wooden box to a bigger, brighter one decorated by tiny lamps (and yes, they can emanate colorful lights when plugged). Most souvenir shops in Pontianak sell T Shirts with Tugu Khatulistiwa on them. One shirt (in June 2012) costs about IDR 20,000 - 50,000; might be cheaper or more expensive, according to size and material. If you're into souvenirs, I also recommend Dayak woven cloth and batik cloth, sarong and shirts in traditional Kalimantan design. Hand-woven bracelets and beaded accessories are also abundant. The craftsmanship is remarkable and the prices are affordable, too. My friend suggested me to try sengkit syrup with plums, I got it in the airport and yes, it's very refreshing, in a sweet and sour kind of way. I'd love to buy more in the future! I got my partner durian jam from the airport too, and he told me it's very yummy. Pontianak is a fan of aloe vera so you can buy diced aloe vera in packages, aloe vera dodol, aloe vera tea, and... gasp... even aloe vera chips. I think the last one is a bit bizarre so I didn't buy it. But an acquaintance of mine told me it's quite tasty, so if you happen to find some, it's worth a try. Of course, there are more, but alas we only had half a day to explore so perhaps... some other time? And this is how Tugu Khatulistiwa looks from the inside. It is air-conditioned, so after experiencing the heat outside, seeking solace inside is such a joyous thing. My partner and I were taking pictures here and there when the monument-keeper (for lack of better term) offered to take some pictures of us. He even advised us on how to pose. "See, you over there, yours husband over here. That way, you both are standing in different hemispheres. One in South, and on in North, yet you two are still able to touch and hold hands." Who knew that we'd encounter such a romantic soul in Pontianak! So he took some pictures of us, and they turned out great.